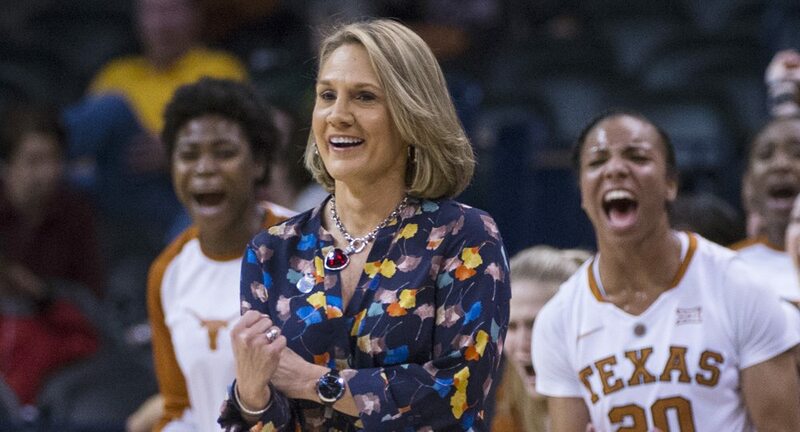 An 89-46 record and three NCAA tournament appearances have earned Texas women's basketball head coach Karen Aston a three-year contract extension (photo courtesy of Texas athletics). AUSTIN, Texas — University of Texas women’s basketball head coach Karen Aston has been so successful in her first four seasons in the position that the UT board of regents voted Friday to give her a three-year contract extension that will keep her in on the sidelines for the Longhorns at least through the 2019-20 season. The new contract, which goes into effect immediately, gives Aston a guaranteed salary of $770,000 and additional performance-based incentives that could add up to $220,000 in additional compensation. The bump in salary represents an increase of $158,187 over what she made last season. Aston has a record of 89-46 in her first four seasons at UT, and has guided the Longhorns to three consecutive appearances in the NCAA tournament, including two Sweet 16 appearances and one in the Elite Eight in 2015-16. In 2015-16, the Longhorns went 31-5, marking the most victories by a Texas team since 1987-88, and their 15 victories over Big 12 opponents tied the school record for the most in a season.